I think we have been here before have we not? A dismantling as we expected. But it wasn't all short combat action tonight. Dillian Whyte edged a barnstormer against Dereck Chisora, while Kal Yafai became a super-flyweight world champion. On 29 April we will know a lot more about him. Because this is on. Let the talking begin - boxing is good at that side of things. There will be chatter, analysis, predictions. All many of us want is a true test. One Olympic champion v another, surely we will get it. For now, goodnight. Thanks for your tweets and company. You've been brilliant, a darn side better than Eric Molina. We should mention that earlier on Saturday the heavyweight division got a new Champion of the Worrrlllldddd. New Zealand's Joseph Parker won the WBO title, (vacated by Tyson Fury, who was in the crowd tonight), with a narrow points win over Mexico's Andy Ruiz in Auckland. What we know now is by May, Parker will hold the WBO belt, Deontay Wilder will likely still have his WBC title and either Anthony Joshua or Wladimir Klitschko will have both of the IBF and WBA straps. Kal Yafai beat Luis Concepcion on points to claim the WBA super-flyweight title. Katie Taylor beat Viviane Obenauf on points. Callum Smith beat Luke Blackledge by KO in round nine. Scott Quigg beat Jose Cayetano by KO in round nine. Frank Buglioni beat Hosea Burton by KO in round 12 to win the British light-heavyweight title. Luiz Ortiz beat David Allen by TKO in round seven. Marcus Morrison beat Harry Matthews by points. Conor Benn beat Josh Thorne by KO round one. "I'm just going to keep on handling business like I should. "Before this fight I was not worried about April, 29 against Wladimir Klitschko - I was just concentrating on Molina. "I don't want to be known as 'champ'. Winning fights doesn't make you a champion. The belt is a sign of a champion but its how you conduct yourself outside the ring that makes you a champion." Wladimir Klitschko on Radio 5 live: "AJ did his job, period, and I am happy he won. Fans want to see us fight. "He was clear, clean and won by knockout and, as his next opponent, it was good I was here to observe it and make my notes. "I am looking forward to the fight. He was my sparring partner two years ago and I said I never thought we'd end up facing each other in the ring. "AJ can unify the division and be a great champion. He's undefeated, has won all of them by knockout, and my guns are cocked. It's not personal, it's business. "I had a long time as reigning champion but this fight is going to be a signature fight to me. It's stands out." Look at that image. One man desperate for the end. One man just toying, cruising, picking apart his rival. The question is, how good a barometer is this for the bigger names - such as Wladimir Klitschko? George Bushbeck: Anthony Joshua - what a boxer. 18 wins, 18 knockouts... Bring on Klitschko!!! Promoter Eddie Hearn says he believes 29 April will be "the biggest fight in British boxing history". Are we getting carried away? What must Tyson Fury be thinking? He was too much for Klitschko who - while we know had a phenomenal career - barely landed a glove on the Gypsy King despite being on home turf. Can we not just get this on now? The two men stare off at one another in the ring. Anthony Joshua: "We move on to a bigger arena, more people can view it. This is the step up people have wanted. Klitschko wants his belts back, may the best man win." "I focus on myself, that's how I beat Wladimir Klitschko." Klitschko: "He is the best man in the division and I believe this excitement speaks for itself. This is what the fans want and this fight must happen. "I've been doing this 26 years and have a lot of knowledge which will help me in the ring." Promoter Eddie Hearn: "Tonight is as good a time as any to announce what's next. "I'd like to officially announce Anthony Joshua against Wlaidimir Klitschko at Wembley Stadium on April 29 for the unified heavyweight championship of the world." Many said this was a pointless fight. What did we learn? Maybe that Anthony Joshua can be patient and understands it's not all about how quick you can win. Even with that patient approach he needs less than three rounds. He barely had to land a punch but when he did, they hurt, they destroyed. I guess bigger names will say they can hurt Joshua but my word does he look like he has concrete in his gloves. It doesn't matter who it is, he will hurt even the biggest names. Tremendous performance by Anthony Joshua. Molina took two or three heavy shots that he didn't need to take in my opinion. Eric Molina is splattered in his own corner, he got caught big time. Will he make the count... he does, just at eight. This is danger, high voltage danger. Joshua corners him again, a flurry, Molina wants none of it, it's over. The initial attack is all about the right hand through the guard. Molina was hurt, almost hiding away when a straight right just crushed his guard and jaw in one swoop. The second attack is almost hard to watch. As the flurry of blows rains in on Molina he again turns away, telling us he doesn't want this. In steps the referee but not before Joshua pings two shots which practically bounce Molina's head around like a balloon. A little lively early on in three, nice head work from Anthony Joshua as he ducks to find the balance to throw a left to the body which kind of shook Eric Molina. For me it's another easy Joshua round. He is dictating pace, he's dictating the range. Anthony just looks so fleet-footed for such a big heavyweight fighter. He is miles the better athlete and he is showing it tonight. Eric Molina springs from the ropes as if to attack, he only got to within six inches of Anthony Joshua's face, nowhere near. This is patient from the champion though, he is in first gear. 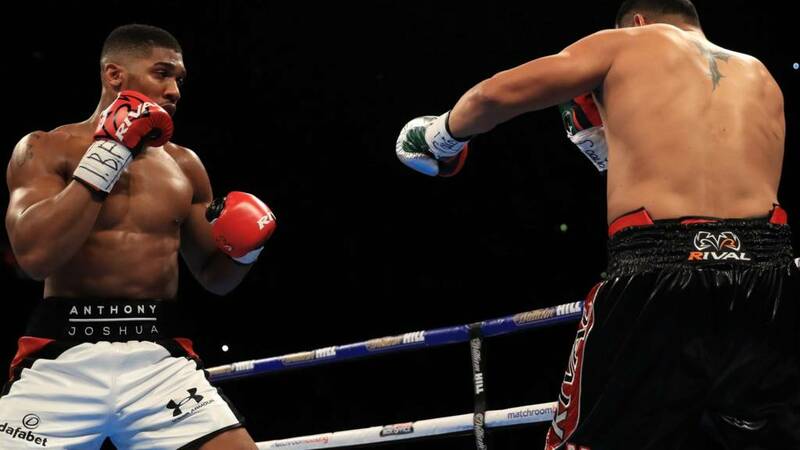 A left, a right barely lands but with his opponent on the move Joshua lands a solid uppercut. We near the end of the round and again it's all posturing and no hurricane from Joshua.